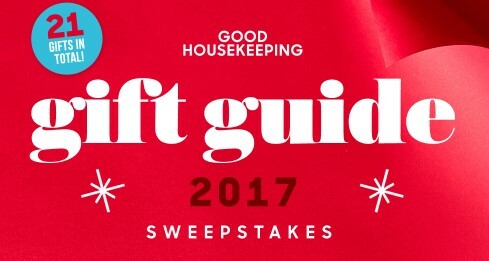 Good Housekeeping will be giving ten lucky winners every item from their 2017 Good Housekeeping Gift Guide! Enter to win lots of great home goods! Ten (10) winners will each win a bundle of items from our 2017 gift guide, including the following: one (1) Bow & Drape Confetti Beanie, $35; one (1) SodaStream Fountain Sparkling Water Maker, $50; one (1) Minted Apron, $38 and one (1) Minted Mitt and Potholder Set, $26; one (1) Sondra Roberts Faux Fur Scarf, $25; one (1) Nature Nate’s Raw & Unfiltered Honey Tin, $12; one (1) set of Garnet Hill’s Felted Wine Toppers, $36; one (1) Kikkerland Guitar Citrus Squeezer, $15; one (1) Love is Love Tray, $20; one (1) No7 Forever Flawless Travel Brush Set, $12; one (1) Brandless Maple Syrup, $3; one (1) set of ED Ellen DeGeneres Sisal Mouse Cat Toys, $6; one (1) Eric & Christopher Santa Penguin Pillow, $25; one (1) Framebridge Instagram Mini, $39; one (1) Leckerlee Lebkuchen Tin, 9.5 oz, $25; one (1) Old Navy Metallic Cardholder, $5; one (1) $50 gift certificate to PBteen; one (1) Perpetual Kid Small Floating Glitter Frame, $8; one (1) Mako by Rabbit Decanter, $20; one (1) DII Rustic Farmhouse Cotton Chevron Blanket Throw, $18; and one (1) pair of SoundLogic XT Foldable Bluetooth Headphones in Rose Gold, $20. Total ARV: $488. (Total ARV for all Winners: $4,880).